Going through a feeling that your home seems over-packed with things? Here are some DIY tips to make all the mess disappear. 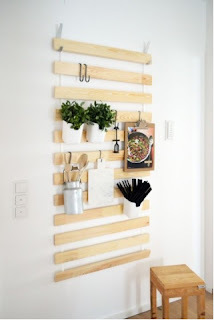 Trust me, these are very helpful in terms of utilising the ample space on walls. Also, it can easily hide under your bed, and the wooden planks hold newspapers and magazines, condiments, even shoes with ease. 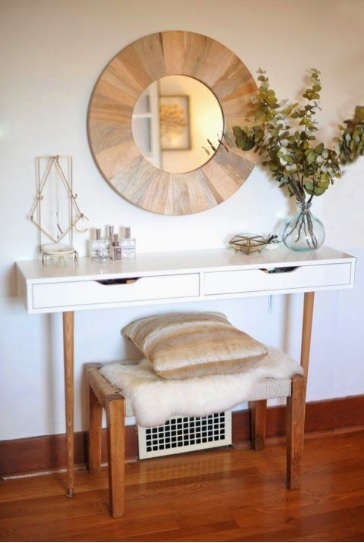 Beauty fanatics, get your paraphernalia organised the chic way with this cleverly-mounted shelf that boasts tapered wooden legs and two compact drawers that can hold the largest lipstick stockpile. 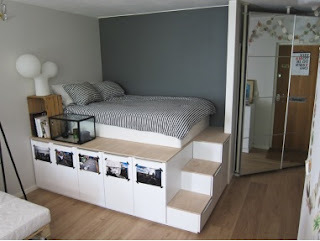 If you think your bedroom does not have enough space to store your apparels and slippers, then here is a quick solution. Mount your bed on top of these compact cabinets and make space for your everyday clothing.